There’s nothing wrong with my website, it’s fine! Why would I want to waste the money on a new one? Is this what you think? If so, now may be the best time to invest in a new website. If you have no idea who’s visiting your website, why do you even have one? It’s really important to see how many visitors you are getting, and where they are coming from, so you can identify where to improve. Eg if your site isn’t bringing in organic traffic from search engines such as Google, it could be your site is not optimised correctly. Being found on Google is an absolutely vital way of getting free enquiries that haven’t cost you anything. As we’ve gone on and on about, mobile websites are becoming more and more important. Consumers are always on their phones, tablets and other devices, and Google knows this and has begun prioritising sites which take this into account. So if your website doesn’t come up on a mobile device, it’s super tiny or if it looks like it’s broken into pieces, then it’s time for a look at a redesign. All of our websites are responsive meaning no matter what device you are on, the website looks good and ‘responds’ to the device it’s being viewed on. Being found in the search engines is important. It helps drive the right traffic to your website and in turn, helps you increase bookings. While there’s no magic bullet here which will guarantee you top rankings, and to be perfectly honest, anyone who tells you that the can guarantee it, is a liar. All our sites are designed to be search engine friendly, announcing new content to the search engines and making sure they are easy to locate. It can be hard to swallow the costs involved in redesigning your website after you spent hundreds of thousands of pounds on it just a few short years ago. But if you want to do well online you need to change and update your website every few years, if not sooner. It’s important to stay on top of new technology, code and online methods of driving traffic to your website. And if your website bothers you because it’s not much to look at, or it functions poorly – then don’t let money be the motivator (or lack thereof) in why you’re not redesigning. The reward of a new website will kill any ill feelings you had about your old slog of a site by increasing visits and ultimately, sales and bookings. 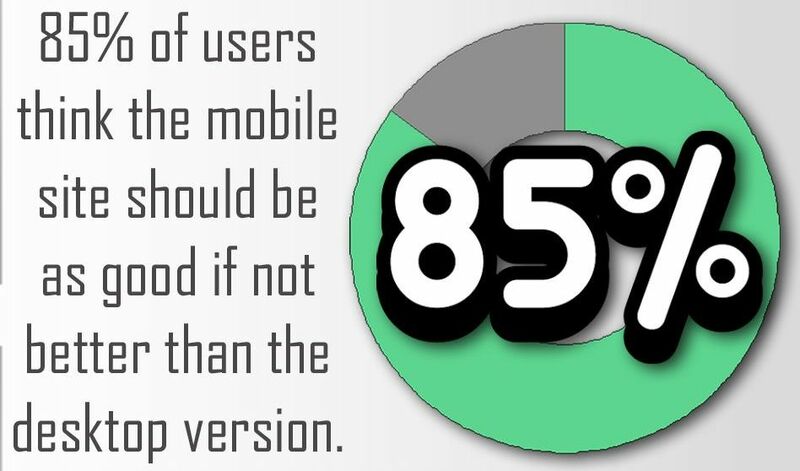 85% of users think the mobile site should be as good, if not better than the desktop version.